Aluminum tread plate has advantages of beautiful appearance, can anti skid, strengthen performance and so on. 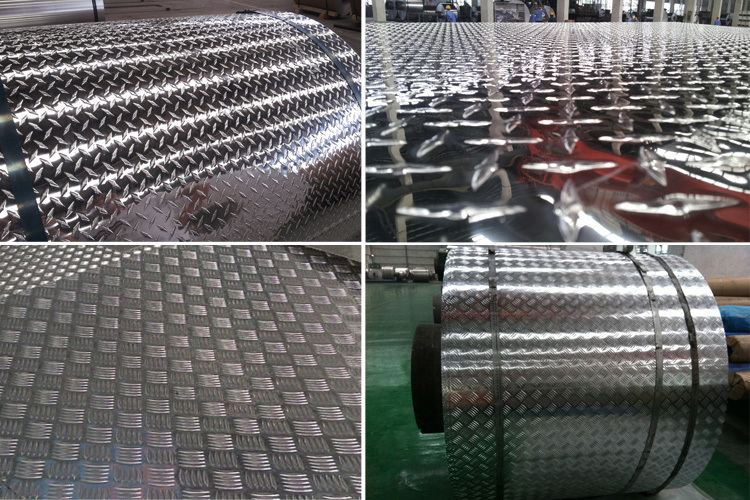 Aluminum tread plate are widely used in the transportation, construction, decoration, equipment floor, machinery, shipbuilding and other fields. Aluminum treat plate is a high cost of modern materials, there are many types, it has a wide range of application in furniture, such as refrigerators, air conditioning, cars, platforms, packaging pipes, screen skeleton, a variety of hanging beams, table feet, Handle, trough and cover, chair tube and so on. In general, in the use, the mechanical properties and the mechanical performance requirements are not high, so the quality of the aluminum tread plate is mainly about the pattern rate, pattern height, pattern height difference. Currently the available thickness is 2.0-8mm on the market, the width is 1250,1500 mm. And for special places (such as the places need to vacant, or in the high corrosion degree, or easy to rust and corrosion), 5052 or 6061 anti-rust anti-skid aluminum plate is recommended to use, the series of non-slip aluminum has great performance of anti-rust, corrosion resistance. For the vacant place, the staff need to step on it, the proposed use is alloy series, while the thickness is not less than 6.0mm, the series and thickness of the non-slip aluminum plate to keep the safety of staff maximize, while ensuring the life of non-slip aluminum plate.